Obituary – Lambert, Marie Elizabeth (Peitz) « Perry High School Alumni Association, Inc. The funeral service for Marie Elizabeth Lambert, 95 year-old Enid resident will be 10:00 AM Friday, September 18, 2015 in the Henninger-Hinson Funeral Home Chapel. The Rev. Gail Edmison will officiate. Burial will follow in Enid Cemetery. Marie was born April 13, 1920 in Perry, Oklahoma to William and Suzi (Rolling) Peitz and died Tuesday, September 15, 2015 in St. Mary’s Regional Medical Center. 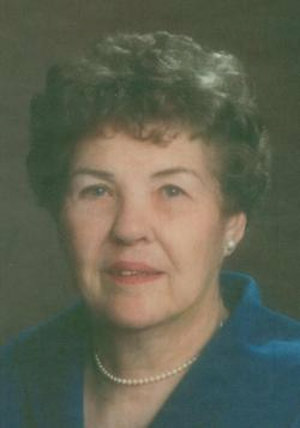 She attended St. Joseph’s Acadamy in Perry and graduated from Perry High School with the class of 1938. She studied in Ponca City as a nutritionist and worked at the Hospital in Ponca City. On September 5, 1948 she married Milton “Bub” Lambert in the First Christian Church in Oklahoma City. The couple made their home in Enid. She was an excellent seamstress and made drapes for the C. E. Loomis Company. She also owned and operated the Lambert Laundry at what is now the Southgate Shopping Center for 10 years. She was a member of Willow Road Christian Church and Davis Park Christian Church. She was a member of the DAV Auxiliary. She is survived by her two daughters, Debbie Lambert of Enid, and Sherry Boyd and husband Gary of Denton, TX. One sister, Maxine Harak of Marshall, OK, and numerous nieces, nephews, and cousins. She was preceded in death by her parents, her husband “Bub”, one infant son Larry Lee, and one brother, Frank. Memorials may be made to either OMRF (Cancer Division) or MD Anderson through Henninger-Hinson.